﻿ Ambient Weather WS-2902 Review: Is It Worth the Money? Today we are going to review the Ambient Weather WS-2902 Osprey home weather station. In this review, we will dissect exactly why it’s ascended to become one of the best-selling weather stations on Amazon. Ambient Weather has cemented themselves as one of the leading weather device retailers on the web. While you can find a host of brand-name stations for sale through their website, the company also sells its own line of weather instruments on Amazon. Ambient Weather is most notably renowned for consistently finding the perfect balance between features and affordability within their lineup of weather stations. Their latest model, the WS-2902 Osprey lives up to those same expectations. While we’re still partial to the Davis Vantage Pro2 or the Vantage Vue for near professional-grade accuracy, The WS-2902 is our new top pick under the Value Weather Station category—and the sheer number of features at this price point has made it our overall Editor’s Pick. We were pleasantly surprised to see the WS-2902 do so well in terms of accuracy when compared to the Davis stations (arguably the gold standard in personal weather stations). Ambient’s decision to include features like UV and Solar data (something you’re paying extra for on the top-of-the-line Vantage Pro2) and user-friendly internet connectivity via WiFi makes this hard to say no to. It measures all the weather data most of us would ever need—inside and outside temperature and humidity, barometric pressure, rainfall, wind speed and direction, plus UV and solar radiation. 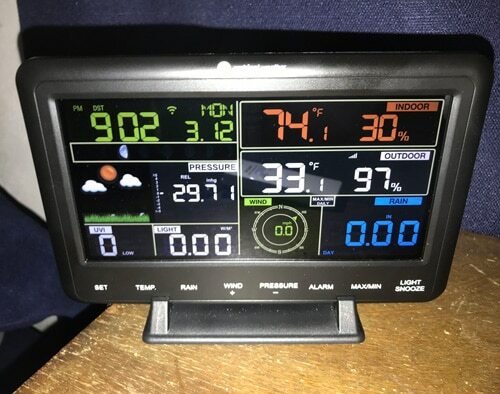 Better yet, it’s the only weather station we’ve found that has a useful Alexa/Google Assistant integration, and you can even use IFTTT to trigger actions on other smart devices based on the measurements from the WS-2902. At this price point, the Ambient Weather WS-2902 offers the most value for money compared to any other weather station on the market right now. 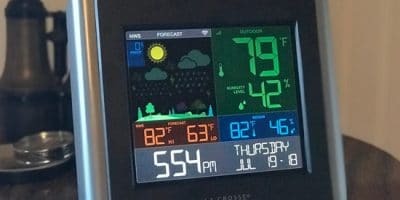 The capabilities of the internet and smart home connectivity surpass even most mid and high-end personal weather stations. If you don’t have a lot of money to drop on a weather station, but you need something reliable and accurate—then the Ambient Weather WS-2902 is the one you want. Installation of the WS-2902 couldn’t be any easier, as it's an all-in-one sensor suite and most of it comes pre-assembled. Even if you’re mechanically troubled, you should have no problem putting this together. 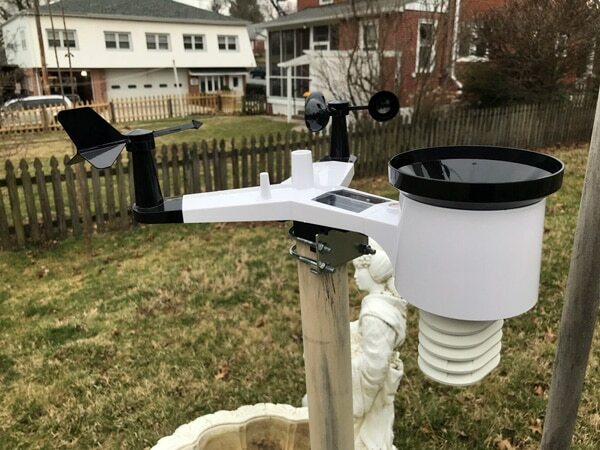 There are very few parts to attach—just the anemometer, wind vane, and the funnel for the rain gauge, and then mounting it on top of a pole on your home or in your backyard. That’s it. Remember to follow our siting instructions when installing your station. You can see below we have the unit installed on a temporary mount just for this review. We normally recommend using the Ambient Weather EZ-30-12 stable mounting kit to get the most accurate readings from your sensor. The WS-2902 on a temporary mount in my backyard. Other than a few adjustments and removal of protective stickers, you’ll have this done in less than an hour. This just leaves you to set up the desktop console, which is equally as easy. One thing that makes all this possible is the excellent directions. The WS-2902 is accompanied by one of the most readable and easily understandable weather station manuals I’ve seen. After setting up many of these, I can tell you at times it can be a pain. Poorly written manuals make it worse, but that’s not the case with the WS-2902. I was pleasantly surprised to see the WS-2902 hold up so well against the Vantage Vue, however, expect a little more variability in terms of accuracy. But, keep in mind that the WS-2902 retails for approximately half the price of the Vantage Vue. Temperature and humidity readings were ever so slightly off from the Vantage Vue, and winds were reasonably accurate. However, its response to barometric pressure readings didn’t seem as precise. Rainfall readings also seemed to vary further from our Vantage Vue station and true conditions. At this price point, these accuracy variations from the higher-end stations should be expected. Don’t think our less than stellar accuracy reviews mean the station isn’t a worthy option—it is one of the most accurate value priced weather stations we’ve tested so far, period. Plus those looking for accuracy are going to be willing to pay more anyway, whereas the vast majority of consumers won’t—or frankly don’t need to. The WS-2902 sends updates to the Internet every 60 seconds, with a 16 second refresh time to the console. 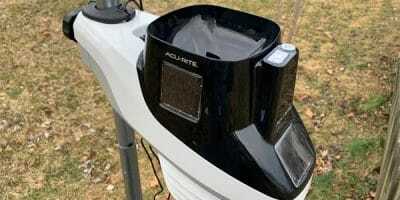 The outdoor sensor has a 330ft wireless range to the console and is powered by solar panels that charge a supercapacitor for operation throughout the day with batteries used as a back-up so you receive accurate measurements 24/7. You might be wondering what the difference between the WS-2902 and the WS-1002 weather station is? The feature set is the same here because they contain an identical sensor suite but the WS-2902 has an updated and improved design. The other main difference is the WS-1002 comes with a TFT display while the WS-2902 has an LCD display. As the WS-2902 retails for considerably less with the same sensors, it’s definitely the better option of the two. While this station certainly scores high on features out of the box, the WS-2902 falls behind on expandability. It can't accommodate additional sensors. We don’t see this as much of a problem considering what you get out of the box and its intended market—if you’re looking for something that can function with extra sensors, we’d recommend the Vantage Pro2 WS-2000. However, there is a workaround, by purchasing separate internet-connected sensors from Ambient Weather, you can add an unlimited amount of devices to their cloud platform (AmbientWeather.net), and they are then seamlessly connected online with your station's data. This article provides some more information. Update: Ambient Weather has released an upgraded version of the WS-2902. The WS-2000 Smart Weather Station which comes with a high definition TFT display tablet that supports up to 8 additional thermo-hygrometer sensors. Internet connectivity is where the WS-2902 shines, and all but wipes the floor with the competition. Of course, you’ll get the connectivity with Weather Underground, Weather Bug, and Weather Cloud, but that’s to be expected of any weather station these days. The WS-2902 does plenty more than that. Ambient Weather has also created their own cloud reporting platform called the Ambient Weather Network. Davis does something like this. However, it’s limited to a closed system and reporting to Weather Underground and the National Weather Service’s CWOP program. Ambient takes it a step further. 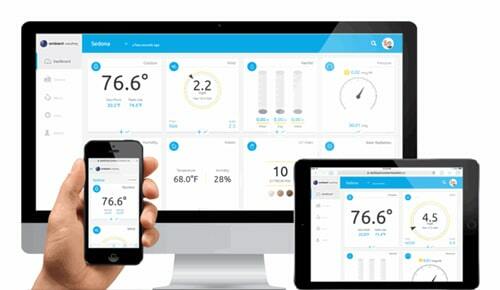 Monitor your local conditions from any device with the Ambient Weather Network cloud platform. With the Ambient Weather Network, you’ll be able to view real-time and historical data from your computer, smartphone or tablet at any time. You can create customizable alerts and integrate your weather station with IFTTT to control external devices like sprinklers and lights. You can also use Amazon Alexa and Google Home to ask about current conditions, something that as far as we know only the Netamo Weather Station can do, and in a much more limited fashion than the WS-2902 can. We are big fans of the WS-2902’s connectivity options. With smart homes all the rage, it’s becoming ever more important for this functionality to be present in other devices where the data they collect could be potentially useful. Weather data can be used in a variety of these devices, whether they be smart thermostats, sprinklers, switches and so forth. We’re also impressed with the construction—at this price point, the instrument housings on other stations can sometimes feel cheap. We didn’t get that impression with the WS-2902. Something that we haven't mentioned so far in this review that really impressed us is the after-sales support and warranty from Ambient Weather. We didn't run into any issues ourselves, but we've heard from other customers that have had some minor problems and they've been more than satisfied with the response time and the level of support they've received. In fact, the CEO, Ed, has frequently been known to personally take care of any support requests. 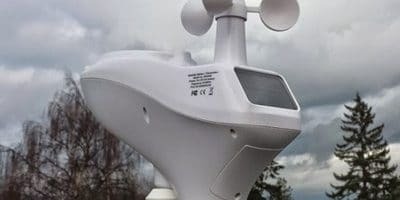 There is also a very active Ambient Weather user group on Facebook where owners of the WS-2902 and other Ambient Weather models share photos of their setup, troubleshoot any issues together and offer advice to new weather station owners. The WS-2902 also comes with a 1-year warranty for complete peace of mind. There isn’t much not to like about the WS-2902, but if we had to list any negatives, it would be its lack of expandability and the limited viewing angle on the display console. Some weather station users will have a legitimate need to add additional sensors, (most likely for gardening or farming to measure soil moisture and leaf wetness) but for most, it's unnecessary. So far, only the Davis Vantage Pro2 has been the go-to station for those requiring more than just your standard weather observations. The Ambient Weather WS-2902 has a large color-coordinated display console which is easy to read at the right angle. The viewing angle on the display might worry some users, but with the connectivity to Weather Underground and Ambient Weather Network, you'll find yourself using your smartphone to view the data most of the time anyway. At this price point? No. The WS-2902’s feature list blows all the other value weather stations on the market out of the water, and competes head-on with some of the professional weather stations. It’s a definite yes. Ambient Weather has done a fantastic job in packing a ton of features into an affordable unit. We’re especially captivated with its connectivity options, which of the stations we’ve tested so far is best in class. The seamless setup and smart home integration will have the whole family taking on a new interest in the weather. It’s easy to see why this station has become so popular on Amazon. For the price, you’re getting incredible value. And with accuracy that is close to that of the Davis Vantage Vue, you really can’t go wrong here. Click here to buy the Ambient Weather WS-2902 Osprey on Amazon. The Ambient Weather WS-2902 Osprey WiFi 10-in-1 is the perfect model for weather enthusiasts who need a reliable, user-friendly and accurate weather station without breaking the bank. The accuracy of the Osprey station isn’t up to the same standard as the more expensive Davis Vantage Vue or Pro2, but at this price point, the WS-2902 cannot be beaten for value. Good review, about the only thing you didn’t mention is the 2902 works with the ObserverIP, which opens it up to the wider works of reporting to CWOP and a ton more sites via a a weatherbridge/Meteobridge solution. Couple of observations here…. As a 2902 owner, I love mine. Couple of pieces of advice to those looking to mount their stations higher up. I use the side mount and have mounted it to my deck railing. Making sure the station is level is critical to the gauge treading rain properly. Ambient Weather sells pole extensions for many of their mounts. Suggestion, level the unit BEFORE lifting it skyward. Unless you can fly, reading the level is impossible thirty feet in the air. These mounts do allow inserting from the bottom. Lock the station to the mounting pole and level it. Also note the north arrow. Align that by turning the pole, not the unit. To raise unit, loosen pole at deck level, insert pole in bottom and push up. Lock down pole where it reaches the height you wish. The station should remain level if poles are merged properly.